I'm wiped out. 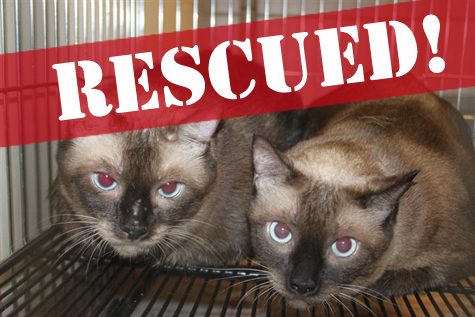 I spent all day yesterday emailing rescues, trying to sort out what could be done to save the lives of these big siamese brothers. I wasn't surprised to get lots of “sorry, can't” replies, but I had to keep hoping someone would be willing to take them on. I started to think that someone was going to be me, but I'm going to have a full house pretty soon and I was worried that if I said, yes, to the boyz, I would be taking on way too much. Many of you wrote to me and offered suggestions and even contacted some rescues on behalf of the kitties. Thank you all for your help! Even though most didn't pan out, it only takes ONE “YES!” to make the difference. Yesterday morning, Marty, from DCIN , went to the shelter and checked their blood sugar levels. Neither cat is diabetic which will make placing them that much easier. Thank you, Marty & DCIN! Yesterday afternoon, I contacted our friend Jennifer H. at the Humane Society of Forsyth County . You may remember Jennifer, she was the one we got to rescue the Cow Mama and Babies  and the kitten with the deformed legs . I didn't expect that Jennifer could help, but I didn't know one thing-Jennifer has a soft spot for fat cats, especially siamese cats! When I asked her for help, she said, YES! Even though Jennifer is out of town attending a family FUNERAL, she took the time to reply to me and give me the OKAY to pull these cats on her behalf. I offered to do a fundraiser to cover the initial costs for vet care and food (the cats MUST be on a grain-free canned diet now), to make it easier for her to agree. Meet Nigel (left) and Basil (right). A few minutes ago, Bobby, our intrepid cat-rescuer, picked up the cats and they are now at the Vet, waiting to get their very important snap test. We all have to cross our fingers and hope that both boys are negative/negative for FIV and Feline Leukemia!! After that, it “should” be smooth sailing. They'll be whisked away to their Auntie Bobbie's house to be fostered until they can be moved northe to HSFC. We named them, Basil & Nigel after Basil Rathbone, the actor who portrayed Sherlock Holmes in the 1940's and Nigel, after Nigel Bruce, who portrayed Dr Watson. Our coffers are almost empty and we REALLY NEED HELP getting funds together to cover the Vet care and the boy's food for the next few weeks. If you can help make a donation towards their care, it's tax deductible! Thank you for all your support and for caring about these big boys. I hope to report, one day, that they are sliming down and blossoming into fine felines. The weight loss process must be done slowly and carefully, so it will take some time, but one day they will be feeling much better! Today starts their new life! YEAH!!!! We are glad they are safe. GOOD JOB!!! We´re sending so many purrrs for you!!!!!!!!! !